If the US official is correct, Turkey has committed a war crime by shooting down a Russian plane that was operating in Syrian airspace at the invitation of the Syrian government. 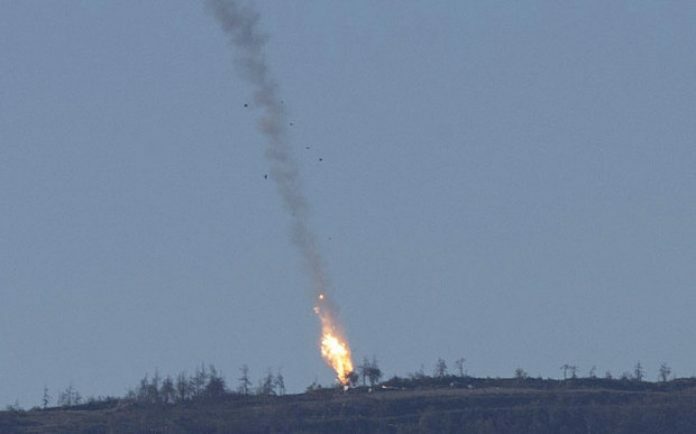 “The United States believes that the Russian jet shot down by Turkey on Tuesday was hit inside Syrian airspace after a brief incursion into Turkish airspace, a U.S. official told Reuters, speaking on condition of anonymity. According to Russia Insider : Even if we assume that the Russian jet briefly entered Turkish airspace, it would be a clear violation of international law for Turkish fighter jets to attack the plane inside Syria. What’s puzzling is that it’s highly unlikely that Turkey acted without consent from the United States. Is Washington having second thoughts about this clear provocation? [This incident] points to an ongoing problem with the Russian operations. They are operating very close to a Turkish border, and they are going after moderate opposition that are supported by not only Turkey but a wide range of countries. The problem with the “moderate opposition” line is that Reuters reported today that al Qaeda’s Nusra Front operates in the region that was being targeted by Russia during the time of the shoot-down. And just a reminder: NATO still “stands in solidarity” with Turkey.